Jay Leno is a longtime Lamborghini man. He owns several, including a couple of Miuras, an Espada and a Countach, the latter having served as his daily driver for several years. Leno’s car collection is vast (supposedly almost 300 cars), but one of the brands not included is Ferrari. It’s not that the guy doesn’t like Ferrari, but he’s more into Porsches, McLarens and, of course, Lamborghinis. So imagine Leno’s excitement the day this Huracan Performante rolled into his garage to film a new episode for his YouTube series. Amazingly, Leno admits this is the first modern Lamborghini he’s driven in a few years, and the automaker has come a long way during that time. For example, its cars, even the Huracan Performante, are more refined than ever while still managing to retain the required bit of madness. The Huracan Performante was, until the Porsche 911 GT2 RS came into the picture, the Nurburgring lap record holder. But unlike Lamborghini before it was under Volkswagen Group ownership, its cars todays are of the highest build quality. They’re also far more comfortable. Leno notes that despite the Huracan Performante’s track focus, it’s also a mighty comfortable daily driver. Heck, he describes it as a fine blend between an extreme hypercar and a GT car. 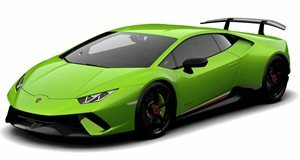 And speaking of hypercars, the Huracan Performante’s $275,000 sticker price, Leno points out, is, though not cheap, something of a bargain. Compared to the McLaren P1, which Leno also owns, the Huracan Performante is nearly as fast and just as exotic.